I've loved fried rice for as long as I can remember. Rosie at Ho Sai Kai knew that fried rice, chow mein and eggflower soup were the only items on their menu I would dare to eat. For me, it's comfort food, same as pizza. Just like the key to a great pizza is the crust, the key to good fried rice is the texture of the rice. 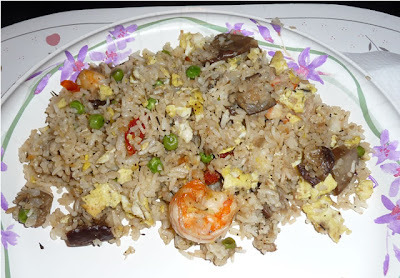 I don't like the Hawaiian-style or Japanese-style fried rice dishes because the rice is too sticky, mushy and clumpy. For me, the grains have to have a texture like, well, like day-old rice which is what the recipe calls for, doesn't it? My dad used to make a great pan of bacon fried rice, with lots of bacon, eggs and mucho heavy on the garlic. So unhealthy, I bet, but so good. He worked odd shifts for his job and I recall getting out of bed very early one morning while it was still dark, and he was in the kitchen cooking a skillet of his specialty. I don't know if he had gotten back from work or was getting ready to go. Even though I was half asleep, I sat down at the kitchen table and he gave a portion to me. For the next few days I would attempt to get up early and sneak to the kitchen to see if he was making fried rice again. Then my mom caught on to what I was doing and told me not to get out of bed and to keep sleeping. He'd still be making it years later when I was dating Amy. After dinner I would go to her house and she and her two sisters, Grace and Irene, would complain to no end about my reeking of garlic. "Did you have fried rice again???" "Yes you did! You can't hide it!" "Tell your dad to lighten up on the garlic!! You stink!!" The rice we have is usually equal parts Japanese, Jasmine and Basmati which gives it a nice texture as well as aroma. I lightly scrambled some eggs. The rest of the kitchen sink consisted of sauteed Japanese eggplant, green peas, shrimp and sun dried tomatoes plus a bunch of garlic powder and some "Napa Valley" seasoning I got from Amazon.com. No shoyu (soy sauce), though. Is it sacrilege not to use that in the fried rice? I find it tastes fine without it. I used to make fried rice using a light dose of barbecue sauce in place of the shoyu and that worked pretty good, too. Anyway, the eggs get lightly scrambled and set aside. Then the eggplant is sauteed, peas added a little while later, then the shrimp, and then the rice and seasonings. I stir and flip it all around then add the chopped-up sun dried tomatoes and eggs, and mix it all up. And then it's done! While I'm at it, I thought I'd throw in some pictures of our typical salad. 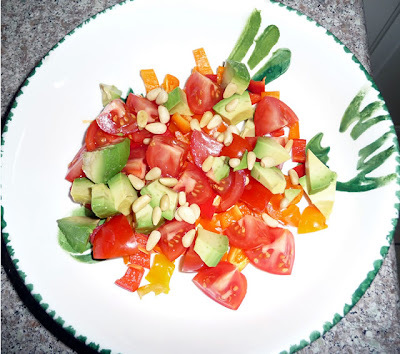 First, the substantial stuff for the "base" - tomatoes, sliced mini-bell peppers, avocados and pine nuts (all from Costco, of course). 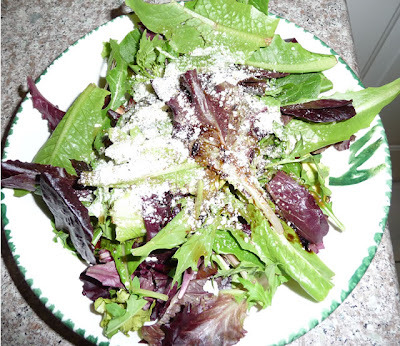 Then on top of that goes the baby lettuce and a sprinkling of grated Parmesan and Pecorino cheese (the only non-Costco item; this comes from Trader Joe's) and finally, the salad dressing. Even though it was beautiful outside today (Monday), I felt lethargic. Maybe because I was inside, at the office and it was a pretty boring day. Or maybe it was because I got to sleep too late the night before from thinking too much about how cheap stock prices were on Friday (alas, a lot of the bargains disappeared on Monday), or maybe it was a combination of everything. So not having any idea of what to write for this entry, I figured you can't go wrong with food; that's a subject that usually wakes people up. It woke me up!